Happy New Year everyone, I hope that 2017 brings you all happiness and prosperity. 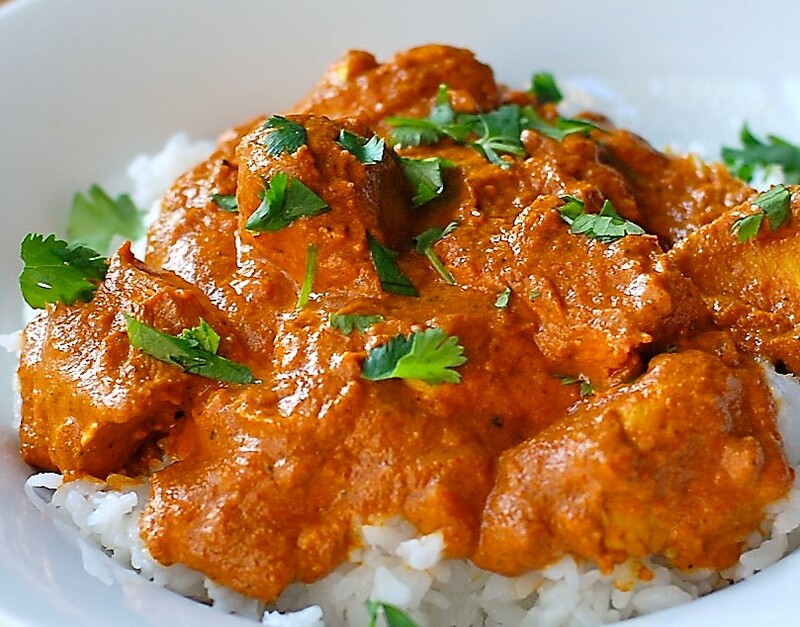 I decided to kick off the year with a dish that’s packed with flavour and extremely delicious; the classic Chicken Tikka Masala. This is a dish that I absolutely love, and I regularly use this amazing recipe from Madhur Jaffrey. So try it yourselves guys and start your 2017 with a kick. Start by marinating the chicken. Put the chicken in a bowl and rub in the salt and lemon juice. Pierce the chicken pieces lightly with the tip of a knife and rub in the seasonings again, then set aside for 20 minutes. Add the ginger, garlic, cumin, paprika, chilli powder, cream and garam masala. Mix well, cover, and refrigerate overnight for six to eight hours. Now make the masala: pour the 4 tablespoons of oil into a large, non-stick pan and set it over a medium-high heat. When the oil is hot, put in the onions. Stir and fry until they brown, 6-7 minutes. Add the ginger and garlic and continue to fry, stirring, for 1 minute. Add the ground coriander, turmeric, chilli powder and paprika. Stir then add a tablespoon of the yoghurt. Stir and fry until it is absorbed. Add the remaining yoghurt a tablespoon at a time. Now put in the tomatoes. Fry them for three or four minutes. Add the stock and salt, cover, reduce the heat to low, and simmer gently for 15–20 minutes. The sauce should turn thick. Stir in the garam masala and coriander leaves, taste and add more salt if you need it. When the chicken is cooked, reheat the sauce and mix in the chicken. Serve immediately with fluffy rice. A good start to a year! LT for 2017 you should also invite Guest Chefs to present their receipes…keep Kanta as your resident chef!! Madhuar Jaffrey, class reference, used to watch her series on telly. Very nice. I’ll bring out my Tandori oven from storage to do the chicken bit to make it more authentic rather than the oven.